In this talk, philosopher Cynthia Freeland discusses Clarice Beckett's painting 'Evening, St Kilda' (c1930). Responding is Sydney artist Claire Healy. Cynthia Freeland is Professor of Philosophy at the University of Houston, USA, and until recently was the president of the American Society for Aesthetics (2015-2017). She writes on ancient philosophy, feminist theory, film theory and aesthetics. Publications include 'But Is It Art?' (2001)and 'Portraits and Persons' (2010). Claire Healy is a Sydney-based artist. In collaboration with artist Sean Cordeiro, she creates extraordinary sculptures and installations made of everyday objects that comment on the residue of consumer society. They have exhibited around Australia and internationally and represented Australia at the 2009 Venice Biennale. 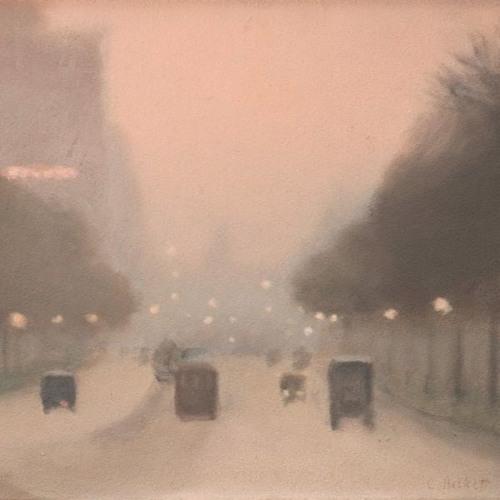 To view Beckett's painting while listing to this talk visit: www.artgallery.nsw.gov.au/collection/works/197.2013/ Image: Clarice Beckett, 'Evening, St Kilda Road' (detail) c1930, Art Gallery of New South Wales.